Shockwaves ran through St Maarten, Anguilla and St Barths. 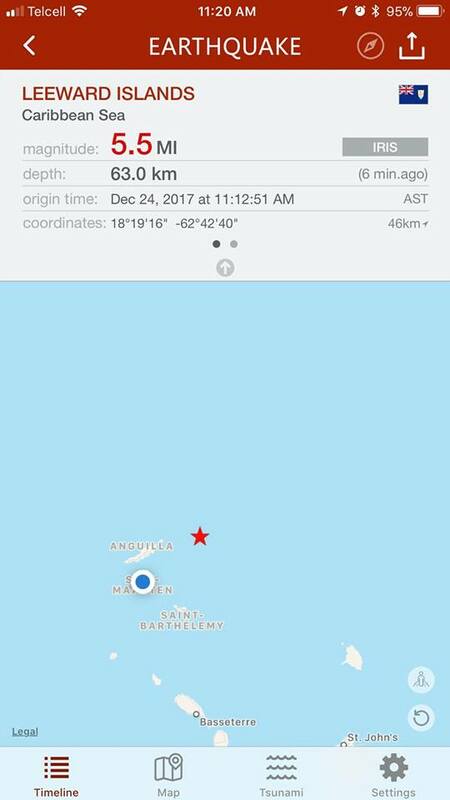 Still recovering from hurricane Irma, a 5.2-5.5 earthquake on the richter scale just shook the islands. There are reports of structural damage, cracks in roofs and walls. We will continue to bring you the latest information from on land and online, including the latest meteorological updates. Although there have been slight tremors for the past few days in the region, no one has felt an earthquake this strong in the area, at least not in recent memory. The tremor was followed by a down pouring of rain. We have photos and hopefully some locally videos also being uploaded right now. All information posted is from reliable weather and meterologoical centers. St Maarteners preparing for the Christmas holidays are still reeling from the most powerful Category 5 hurricane every recorded in history. There are prayer vigils being held as St Maarteners are asking themselves what to expect next, and how much disasters they can manage.